Large container ship loses 250 containers. How? German Spiegel reports that the MSC Zoe, enroute from Antwerp to Bremerhaven in rough seas, lost 250 containers. How do these shipping containers break free with what seems to be a surprising frequency? Or are they designed to do so once a certain force point is reached? Does the shipper just consider these acceptable losses? Interesting question, triggered some research! The standard twist locks holding the container in place are only rated at 20 tons (per corner). A stack of containers in a storm is likely to experience forces considerably in excess of this. Preventive measures should include strapping down to the deck, but this may have been omitted ( a false economy). Human imperfection and the things they build. 1500 containers a year is the average lost at sea I heard. If they sink it is OK but if they are full of furniture and other floatables they may only be a few inches below the surface, invisible until they take the keel right off an ocean going yacht! Stat I see is that ~10,000 containers per year are lost - that includes ships sunk as well as "overboards." Out of 200 million "container movements" per year. Those lost overboard must be the deck cargo - very hard to lose those down in the hold unless the hull comes apart. The containers in a stack are each twist-locked to those above and below at their corners to form a fairly strong unit. The base container in each individual stack is key-locked to the deck, and also lashed and turnbuckled. Independently. No stack or "domino" is attached to its neighboring stacks (for time/cost reasons in loading). The outer stacks exposed to wind and water get additional "wind lashing." Theory being that they will hold the inner stacks in place, like bookends. IF an outermost, wind-lashed stack breaks free and topples, there can be an "inverse domino effect" as the less-supported inner stacks lose the bracing from the outer stack and also topple. I///////_. A whole athwartships "box" of ~60-80 containers can let loose in sequence. In meadowrun's excellent photo, you can see a crewman "unlocking" a corner twist lock to separate a container from those below for off-loading (or cocking it for automatic spring-loaded locking, if that picture shows loading). Note the X-bracing per stack - but only for the lowest layer, and no interconnections between/across stacks. Interesting number and something that never dawned on me in that you would wish the containers to sink completely. That would be a rude and nasty surprise to hit one lolling just below the surface. Great explanation pattern is full - many thanks! Last Summer my sister-in-law sailed from the UK to the USA on one of ACL's ConRos, the Atlantic Star. I know very little about container ships, but I was intrigued by the 'Cell guides on Deck', which appear to offer additional security to the containers. ACL claim to have never lost a container overboard in the last 30 years. Was she crew or a paying passenger, would be interested in the second option?! Richard Branson's yacht Atlantic Challenger quickly sank on 16 August 1985 during an Atlantic crossing record attempt, after hitting what was suspected to have been a container floating just below the surface. I remember the event well because my son was born just as the bow of the yacht disappeared on the TV in the hospital! 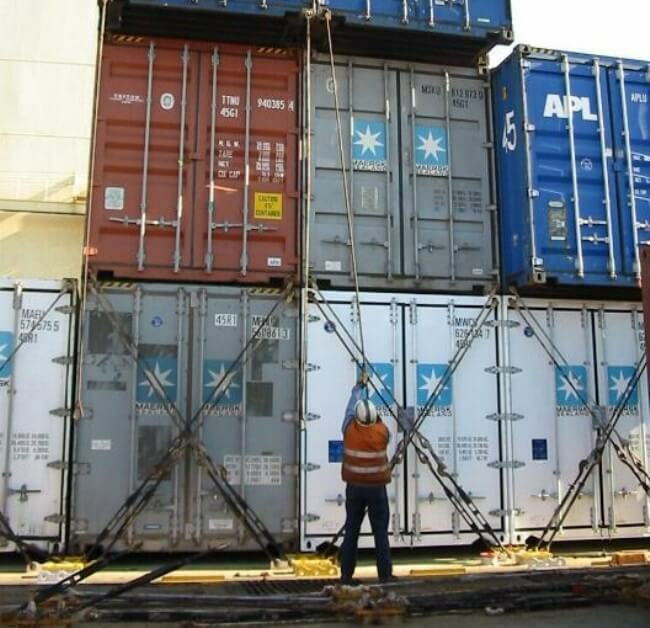 Had a mate who was running some numbers on a damaged container vessel, even putting 200 ton strops on the containers wouldn't have made any difference. When you got to the point the strops wouldn't fail then the anchor points would have ripped out the deck anyway. Thus creating even more damage. Served on a ship called "Norwegian Challenger" plying the North Sea. The insurance company eventually gave us the "First Container To Reach The Beach" diploma and cancelled the insurance. We habitually lost containers and trailers on each winter vouage to the point where we returned to loading port and unloaded the remains with a bulldozer. Not a very successfull design that one. Whilst I don't know the answer to your question, there is a well established market to travel as pax on a cargo ship...which seems considerably more enjoyable than being on a glorified shopping mall and gin palace populated by pretentious panama hat wearing tossers regaling everybody with their tales of cruises past......I also suspect there's no requirement to get dressed up like a mannequin to eat with the Capt. Last edited by Krystal n chips; 3rd Jan 2019 at 08:06. Pattern is Full, that pic shows upper containers overhanging the lower ones. Surely that is not how the would travel? Probably 45s stacked on 40ies. No twist-locks when you do that? Does the shipper just consider these acceptable losses? My wife's employer lost a shipment like that once. Took months to sort out the paperwork (and the customers had to wait until the replacements were manufactured and shipped). What I wasn't sure I gathered, though, was whether it was possible to pay more to have your container placed in a less vulnerable location on the boat. Parametric rolling (Google it) is often the cause of container loss. Zoom in on picture above and you'll see them. Our problem was extremely short roll periods. Snapped chains holding down trailers like wet spaghetti.